The reason for this is that one like it was among the coins given to me when I was a young boy. I was fascinated by the half and large cents, the three cent pieces and the twenty cent piece, but I wasn't very interested in that coin. Oh, the old date was cool, but I thought it was a British coin and that just didn't interest me. 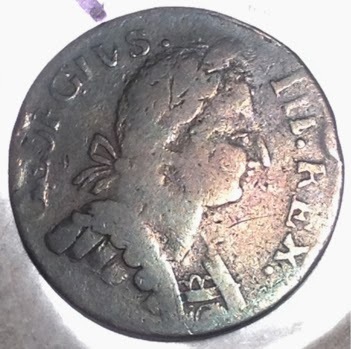 The coin was even lower grade than this one; the date was barely visible and it had been harshly cleaned. With all that going against it, I was not enchanted and at some point I sold it for a few dollars to someone else. 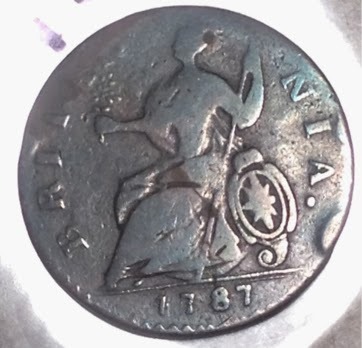 Well, much later I learned that it couldn't have been British because Britain made no half pennies (which is what this is) in 1787. No, it was a "Machin's Mills" counterfeit (counterfeit to British eyes, not American). You can Google "Machin's Mills" to learn more about these, but I was very happy to find an affordable replacement for the oldest of those long lost coins. Ugly as it is, it's one of my very favorite pieces. One note: this coin is probably less circulated than you might think. The folks who produced these wanted them to look used and worn in order to pass them off more easily, so they deliberately designed weak dies and tumbled the planchets to beat them up some! Not Certified. Paid $177.00 in 2014. Collection - Fugio "New Haven Restrike"